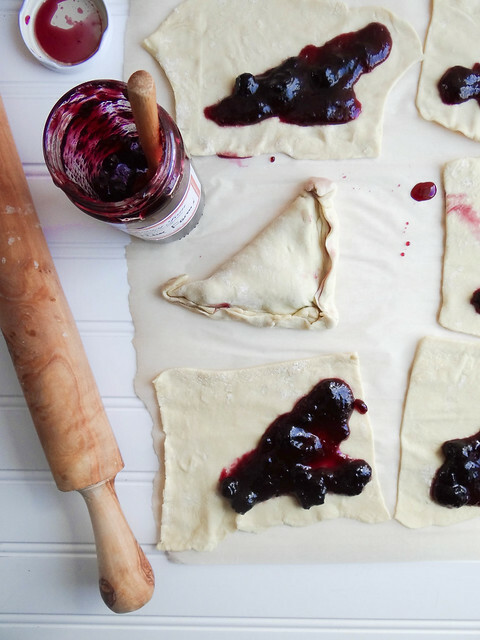 Store bought puff pastry is thawed, rolled, cut into squares & filled with homemade jam. The filled squares are then folded and shaped into little triangles- so easy! Frozen puff pastry takes about 45 minutes to thaw out to the point that it's workable - if you think to plan ahead, simply pop the frozen puff pastry sheet into the fridge the night before, it should be thawed by the time morning rolls around. 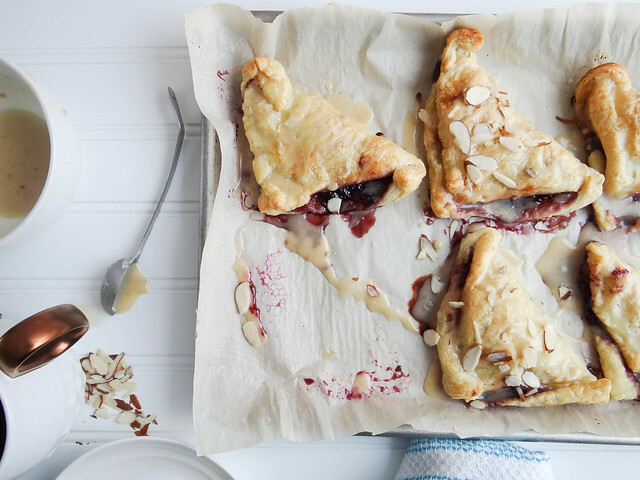 The maple miso drizzle is truly the star of this recipe- didn't think it could get much better than warm flaky pastry filled with local jam, did you? Let me just tell you it totally did, this maple miso drizzle is so incredible; I caught myself going back to the bowl more than once for another "taste test". Sliced almonds are sprinkled on top adding a bit of textural interest- gotta have a bit of crunch in there! I absolutely loved these straight out of the oven, I really wish I could tell you how they tasted the next day, however Justin ended up demolishing enjoying the 5 remaining pastries the next day. Having an arsenal of smaller batch recipes at my finger tips is super helpful; for our waistlines especially. You can easily bake off a double batch or just a few to curb your sweet tooth, the point is bake & eat as many as you want, we won't judge. Do you have a go to quick and easy sweets recipe that can easily be customized- I'd love to hear what's cooking in your kitchens! Lightly flour a piece of parchment paper cut to the size of your rimmed baking sheet and rolling pin (very light dusting). Unfold your puff pastry sheet onto floured parchment. Using a pizza cutter or sharp knife cut pastry sheet into 6 equal squares. Roll each square until it will easily fold onto itself into a triangle shape, careful not to roll out too thin. 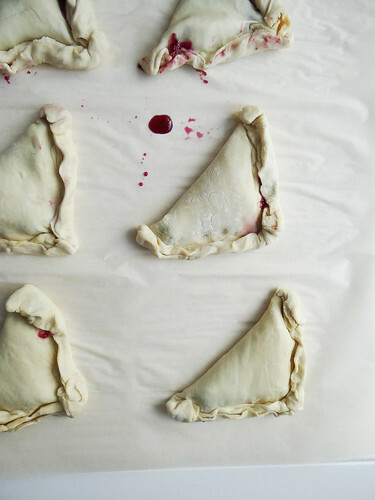 Place 1 tbsp of jam onto one half of the triangle, repeat until all halves are filled with jam. 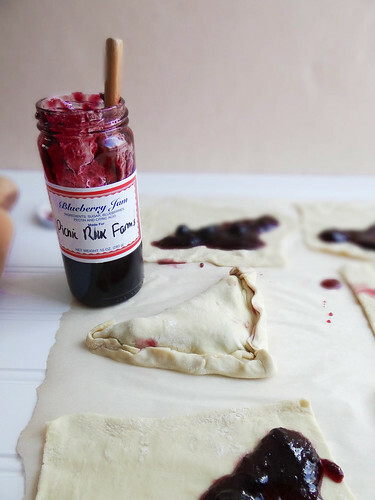 Working with one pastry at a time, flip the non jam side onto the jam filled half. 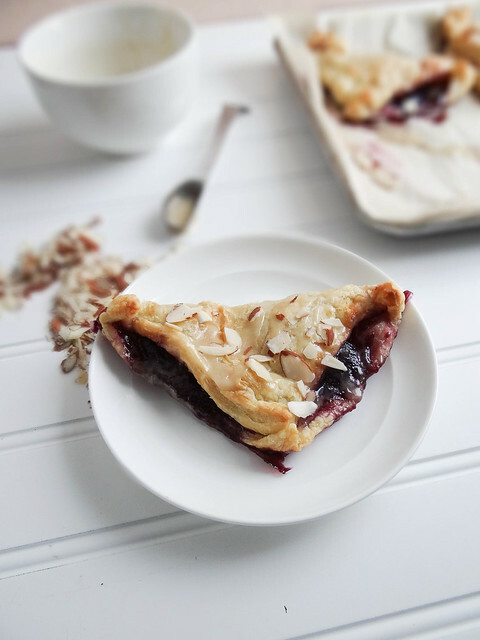 Working around the triangle, seal the edges by crimping the bottom seam up onto the top seam until fully sealed (sides will puff up and some jam will spill out over the side while baking)- repeat until all triangles are formed and sealed. Transfer parchment paper to a large rimmed baking sheet. Bake for 10-15 minutes or until pastry is golden brown and puffy. Remove from oven and allow to slightly cool. 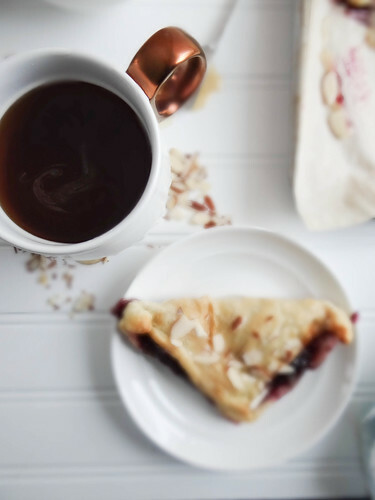 While turnovers are cooling, combine all drizzle ingredients in a small bowl and whisk until smooth and thick. 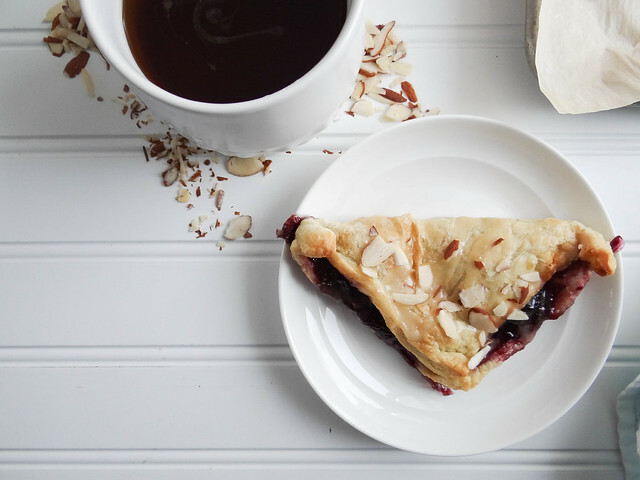 Drizzle the turnover with the maple miso drizzle and sprinkle with slivered almonds. Enjoy warm or at room temp! Beautiful pictures!! I love treats that are visually impressive but don't require hours of work to make. It's been so long since I've had puff pastry, but it really is one of those magic ingredients. Anything is good in a puff pastry. Thank you Cadry! Puff Pastry is pretty magical, I try not too use it often as it is not the healthiest but once in a while is fun! Funny, stuff like this I would never think to call easy, but you're right! It's a cinch - and looks AWESOME! 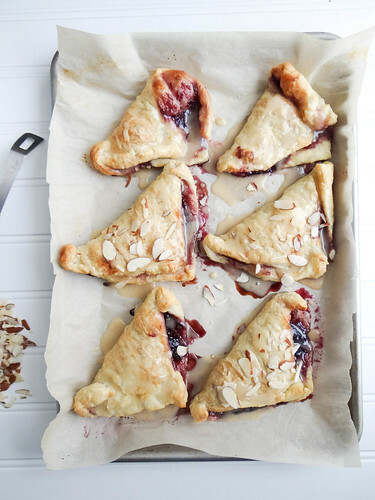 These look incredible - perfectly puffy, flaky, and golden! 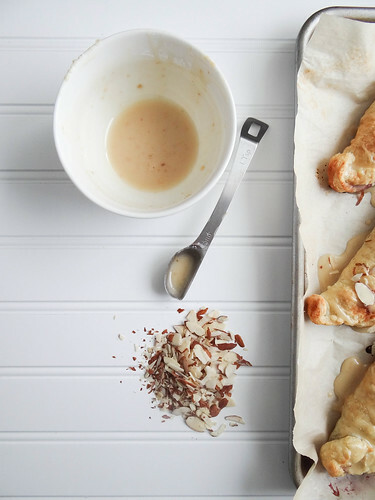 I love how simple the ingredients are, and I would never have thought to add miso to a sweet pastry glaze! Kid you not the maple miso drizzle was incredible! Oh my goodness, these look so delicious! I love anything that can switch seamlessly from dessert to breakfast depending on the time of day. 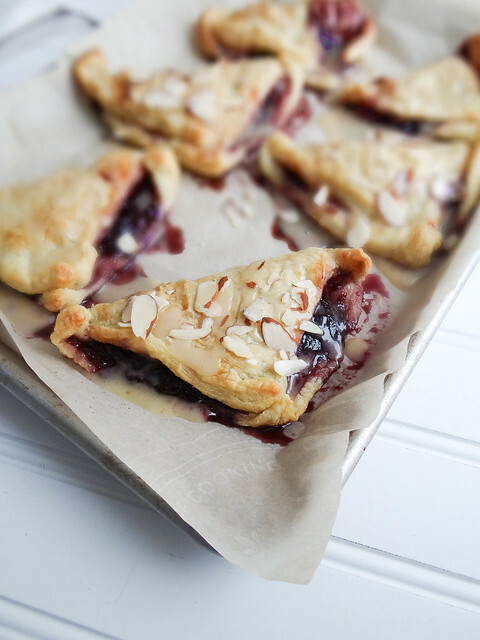 Jam turnovers! 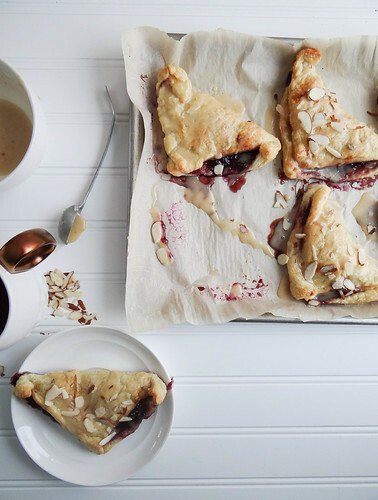 I may have to go get my hands on a package of puff pastry just for this. The miso-maple combination sounds pretty amazing. The maple miso blew me away, way better than I had anticipated! they look amazing! i love the blueberry. Thanks Dina, blueberry Jam is a favorite of mine too! 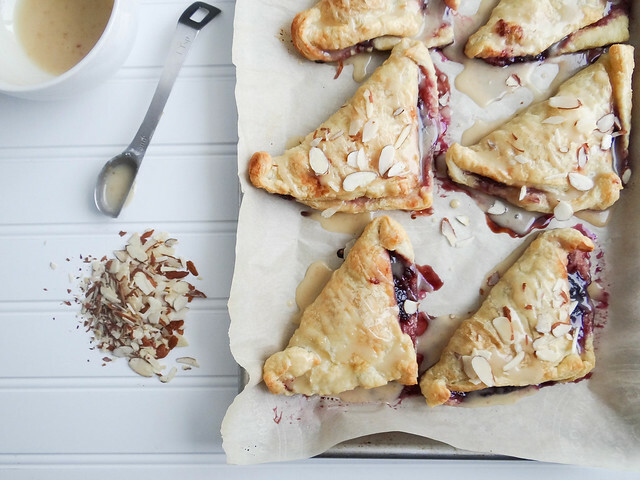 *swoon* these look so delicious and easy! nom nom! :D If only I could find tofu then I could make my own puff pastry again >:( Either way, I'm going see about making these for my in-laws - looks like something that will knock their socks off! I hope they do knock their socks off, these as so easy to make! Miso is so under-utilized in sweets! One of my all time favorite, and totally not vegan, cookbooks is Momofuku's & they have a recipe for a fried miso apple pie. I have been meaning to veganize it for ages. Thank you for reminding me! I totally agree! You should totally veganize that recipe, sounds incredible! If I could, I would too! Beautiful! I would never think to use miso like this, I can't wait to give it a try! Miso is so versatile, I absolutely love miso! Oh man i do not know what I would do without maple syrup! Well these just look amazing and beautiful and I want to eat them all! Thanks for sharing! I never thought of mixing miso and maple but it sounds perfect. Maple and miso are meant for one another! maple and miso together are unreal. i love that you used them for a drizzle here. i bet the combination with blueberries is stunning! What kind of puff pastry is this? Most puff pastry contains butter. Is this oil-based? Awwww thank you so much for the sweet comment!